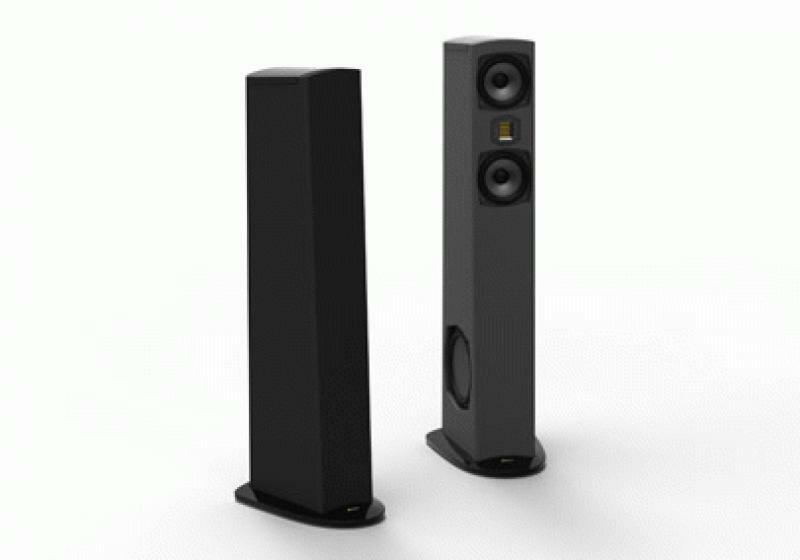 GoldenEar Technology will celebrate its third CES Show with the introduction of the Triton Seven, a tower loudspeaker and the most affordable Triton yet. • See our reviews of the Triton Two and Triton Three speakers. The new Triton Seven ($699.99 ea.) brings Triton Series performance into a more compact size and more affordable price range. It is the first Triton Tower without a built-in powered subwoofer, but GoldenEar maintains it still achieves deep bass performance by combining advanced technology drivers with evolved bass-loading technologies. The Seven's cabinet shape is designed for both acoustics and aesthetics. Reportedly, its rearward rake, in conjunction with the crossover, both aligns the driver array for a coherent wave-launch directed at ear level at the listening position, as well as results in non-parallel front and rear baffles for better control of internal standing waves. The non-parallel side cabinet walls and slanted top provide the same acoustical performance benefit. Like the signature Triton Two, the Seven combines a D'Appolito array of bass midrange drivers, which surround the same, High Velocity Folded Ribbon Driver (HVFR), used in both the Triton Two and Three. The HVFR tweeter functions by pressurizing the air, rather than pushing and pulling it, for better impedance matching with the air. In addition, their curved cone combined with a specially formulated polypropylene cone material and unique apical glue bonding technique helps in delivering midrange clarity and presence. Like the two larger Tritons, the Seven incorporates 2 side-mounted sub-bass radiators that are located on either side of the cabinet down near the floor for optimum coupling to the room.